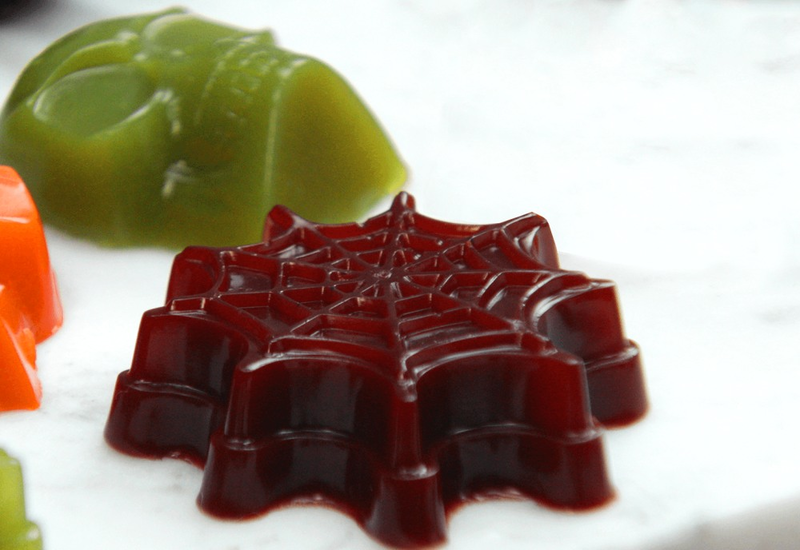 Homemade fruit gummies are so incredibly simple to make, it's almost spooky! Try this recipe for fun, homemade treats the entire family can help make and will certainly enjoy. This recipe uses only 2 simple ingredients: fruit juice and gelatin. We suggest using juices without added sugars, so you won't be bogged down by the sugar highs and lows. This technique works well with almost any juice, though not pineapple. Try a variety of your favorites to see what works best for you. Different silicone molds are fun for different themes. There are so many different kinds out there like gummy bear, stars, hearts, flowers... the options really are endless. Amazon has a great selection or you can find them at kitchenware stores. Per Serving: 27 calories; 0g fat; 5.1g carbohydrates; 2g protein; 0mg cholesterol; 40mg sodium. I love this no-sugar-added treat for kids. Couldn't believe how easy it was to make our own gummy candies at home. Such a fun halloween activity! These fruit juice gummies are so good! I used grape juice and apple juice. What I love most is that it does not require added sugar. Such a simple treat!